«Ήταν μια ενδιαφέρουσα και χρήσιμη συζήτηση μεταξύ δυο ηγετών φιλελεύθερων κομμάτων. Αναλύσαμε διεξοδικά την κατάσταση στην Ελλάδα και την Ευρωπαϊκή Ένωση. Ζήτησα από τον Ολλανδό πρωθυπουργό να στηρίξει τη συμφωνία της 21ης Ιουλίου και έλαβα τη διαβεβαίωσή του γι' αυτό. Του εξήγησα ότι οι Έλληνες έχασαν το 50% της αγοραστικής τους δύναμης και ότι κάνουν μια μείζονα προσπάθεια για να βγουν από την κρίση. Επιπλέον περιέγραψα στον κ. Ρούττε την ανάγκη για άμεσες επενδύσεις στη χώρα μας, για να μπει σε αναπτυξιακή τροχιά η ελληνική οικονομία. Τέλος, τόνισα ότι οι εταίροι μας οφείλουν να γνωρίζουν πως η Ευρώπη δεν μπορεί να λειτουργήσει χωρίς το Νότο, χωρίς την Ελλάδα. Γι' αυτό πρέπει να ληφθούν άμεσα οι αναγκαίες αποφάσεις, προκειμένου να στηριχθεί η Ελλάδα και να βγει επιτέλους η Ευρώπη μπροστά από τις αγορές». Η πρόεδρος της Δημοκρατικής Συμμαχίας Ντόρα Μπακογιάννη, που βρίσκεται στην Ολλανδία ως καλεσμένη της Φιλελεύθερης Διεθνούς και του κυβερνώντος φιλελεύθερου "Λαϊκού Κόμματος για την Ελευθερία και τη Δημοκρατία" (VVD), μίλησε χθες σε εκδήλωση που διοργάνωσε το ολλανδικό τμήμα της Φιλελεύθερης Διεθνούς και το VVD, με θέμα την κρίση στην Ελλάδα και τις αναγκαίες διαρθρωτικές μεταρρυθμίσεις. Η Ντόρα Μπακογιάννη τόνισε στην ομιλία της: «Αυτή είναι όντως μια ευκαιρία τεραστίων διαστάσεων για την αναδιάταξη της Ευρώπης, ενώ ταυτόχρονα μπορούμε να απελευθερώσουμε την Ελλάδα από τα διαρθρωτικά και οικονομικά της προβλήματα. Γνωρίζω πως θα ματώσουμε όλοι. Περισσότερο θα ματώσουν οι Έλληνες. Κατ 'αρχάς πρέπει επειγόντως να αλλάξουμε την πορεία του ελληνικού προγράμματος, κατευθύνοντάς το προς περικοπές δαπανών και μεταρρυθμίσεις, όχι προς την φορολόγηση. Έπειτα, πρέπει να ενισχύσουμε τις παραγωγικές δυνατότητες της χώρας. Η ύφεση θα καταστρέψει την Ελλάδα και θα επισκιάσει την Ευρώπη. Πρέπει επίσης να δημιουργήσουμε ένα ανάχωμα για τις τράπεζές μας, αυξάνοντας δραστικά τα κεφαλαιακά τους αποθέματα και επεκτείνοντας το Ευρωπαϊκό Ταμείο Χρηματοπιστωτικής Σταθερότητας, το EFSF. Πάνω απ' όλα όμως χρειάζεται πολιτική βούληση για να αλλάξουμε την Ευρώπη. Δεν πρέπει να επιτρέψουμε στην κρίση να αναζωογονήσει τον εθνικισμό και να δηλητηριάσει τα μεγάλα μας επιτεύγματα. Είναι λυπηρό, η χώρα που έδωσε στην Ευρώπη το όνομά της και τα μεγάλα ιδεώδη του πολιτισμού της, τώρα να μοιάζει σε πολλούς σαν παρίας και κίνδυνος για την Ευρώπη». Ακολουθεί το πλήρες κείμενο της ομιλίας της Ντόρας Μπακογιάννη. Η ομιλία εκφωνήθηκε στην αγγλική γλωσσά. Διαβάστε τη μεταφρασμένο κείμενο στην συνεχεία στα ελληνικά. Thank you for your kind invitation to address this select audience of liberal politicians, academics and cadres of our brother party in Holland. Our two countries occupy two different corners of Europe but they are, once more, in the same camp in a struggling Europe. We've been allies for long decades and our two nations have fought side-by-side for the cause of liberty and have suffered duress and occupation. Our battleships have navigated the waters at far away seas saluting each other's allied flags and, just as the Greeks have been described as "next to citizens of the world", the same can be said of the Dutch. In times of peace, after the war, we both espoused the cause of European integration which is now going through such a major storm, following the global financial crisis of just three years ago. Both crises are, as George Friedman has aptly said, "crises of political economy". Classical economists, like Adam Smith or David Ricardo, found it impossible to understand politics without economics, or economics without politics. Choices, as Friedman rightly reminds us, are framed by the political system in which they are made. The current economic crisis, in Friedman's words, started as the subprime mortgage meltdown in the United States, in a financial system generating paper assets whose value depended on the price of housing. The price of housing declined and the entire American financial system was placed in a state of gridlock; then the crisis spread to Europe, where many financial institutions had purchased the papers as well. We still suffer from the fact that the political elite allowed the financial elite to manage the system to its benefit. Sustaining the system, on the part of state authorities, turned the crisis into one of excessive sovereign debt. When the crisis arrived in Europe, we hastened to safeguard our banks, while recession set it and it soon generated disproportionate crises in peripheral countries, like Greece. It is important to understand that, despite much literature sustaining the opposite view, the crisis in Europe is not fundamentally about Greece, whose GDP represents no more than 2,5 % of Eurozone GDP. But Europe was in a particularly weak position to face a sovereign debt crisis. Unlike the United States, it has not the institutional capacity to deal swiftly, and through a centralized decision-making process, with the crisis. The U.S. after its war of independence found itself, for a few years, in the same position: a weak centre, independent states, economic crisis and heavy debts. But the perception of an external threat, Britain, united them and the system was hence streamlined and became capable of dealing with the financial and other crises that occurred. Institutionally we are where the U.S. was in 1794! That's the sad truth. - A common currency and monetary system but national control of fiscal policy, finance, and banking. - Capital, but not banks. - Interest rates but not tax policy. - A currency, but almost none of the political mechanisms required to manage the Eurozone economy. The result was that, for nearly 10 years, the weaker economies of the Eurozone were able to borrow massively at German rates. The rate of government bonds in Greece, for example, fell from an 18% point premium over German bonds to less than one percentage point in this period. When the world crisis and recession stopped the high-rates of growth (almost 4% annualy, or more, in Greece for most of the last decade), the structural, political, social and economic weakness of countries like Greece were brought to the fore and the situation led to a ballooning deficit. After trying to set the stage against which the crisis erupted in Greece, and in other E.U. countries, let me try to draw your attention to the particularities of the Greek drama. The Greek tragedy is called a tragedy not only because it has engulfed my own country, other debtor nations, and the E.U. as a whole, but also because it has posed more questions than it has produced answers. "How on earth, he/she asks, are we going to the dogs, when just three years ago the country was enjoying prosperity as the world's 25th richest nation?" Greek GDP before the crisis was just 6 times smaller than India's, a country 150 times larger in population (240 billion to 1,2 trillion in fact). It was twice that of all other Balkan nations, excepting Romania. From 1912 to 1922, the Greek citizen observes, we fought two Balkan wars, we doubled the size of the country, then fought in the First World War, and in the catastrophic Asia Minor campaign. Finally, as a result of that disastrous war, we had to rehabilitate 1,2 million refugees! And we did all that without going bankrupt! How come, they wonder, that, in the middle of a peaceful and prosperous period, we are descending into Hades and we have everybody's finger pointed at us? No wonder you see so many strikes and demonstrations: salaries are cut, sometimes by 40%. The unemployed, between June 2010 and June 2011, increased by 231.000, and their total number is reaching one million, in a Greek working population of five. Taxes constantly go dramatically up and are paid by law-abiding citizens, while the black economy is untouched as yet. The shock and surprise of a swift descend into hell has taken the Greeks by storm. With the exception of the short-lived government of Constantine Mitsotakis, in 1990-1993, no one had warned the Greeks of the underlying deep structural problems of the country, both political and economic. Following the fall of the seven-year-long junta in 1974, a surge to left-wing thinking ensued as a reaction of the Greek society to the extreme-Right-Wing dictatorship. But in 1981 the present prime minister's father swept the country with his left-wing rhetoric, populism, and the dramatic increase of borrowing. A partisan state, a mentality of less, not more excellence, an army of civil servants, and generous, non-productive, hand-outs to vast sections of the population. Corruption bloomed to a degree unknown before, even it was never absent. It has never left us since. - "Closed" and overregulated markets and professions, with licences issued by the state. - Chaotic and time-consuming procedures for establishing a company or factory either by Greeks or as foreign investment. No wonder Greece despite its wonderful position and labour force, lags behind most E.U. states in direct foreign investment. Greece suffered, as a result, from a chronic imbalance between imports and exports with exports, usually no more than a third the value of imports. This was due to the lack of foreign investment, the country's weak industrial base etc, as a result of the great variety of the ills I just described. The usual relief was foreign exchange from shipping and tourism, of around 15 billion euros each, and, naturally, borrowing. As I already said, the low interest rates encouraged borrowing; the irresponsibility, in my view, was both of the givers, as well as the takers: neither the Greek state, nor the E.U., or the financial institutions, sat down for a minute to reflect that this prosperity, and the high GDP growth, was the product of consumption, not production. That's why I believe that all those responsible for this recklessness should, at least partially, undertake the cost, be they Greek or not. Amidst the developing catastrophe, perhaps the only large administrative entity in Greece which enjoyed a triple A rating by Moody's was the Municipality of Athens, over which I presided in the exciting Olympic years, placing its finances on a sound and healthy basis. Athens now passes through its most difficult period and the spirit of elation and effectiveness is almost completely lost, while the city's finances also took a downward turn. I believe you now have a clearer picture of the deep structural causes of why Greece, when development stopped, when the markets were alarmed and when interest rates started climbing to the stratosphere, was faced with a crisis of an unprecedented violence. 30 years of accumulated weaknesses swiftly erupted in a big volcano. The Papandreou government, unwilling to turn against its socialist routes, lost months without reacting, while spreads on Greek state bonds sky-rocketed. The socialists were busy keeping their spend thrift policies alive while taking care to show that Greek public debt was larger than ever-imagined. This led to the first bailout and to the arrival of the "Troika". It was then that my act of national and European responsibility, to sign the Memorandum between Greece, the E.U., the I.M.F. and the European Central Bank, brought my expulsion from what was until then my party, New Democracy which has since followed an increasingly populist and right-wing course. What went wrong, you will ask, and a year later, Greece was in need of a second bailout? The socialist government, unwilling to confront the overblown state sector, because it was stuffed primarily with its own party adherents, was partially unwilling and partially unable to address the main cause of Greece's huge deficit: The reduction of the overblown state sector. It turned against law-abiding and honest taxpayers instead, with successive horizontal income cuts and excessive taxation. No closure of state enterprises; no privatisations; no reduction in the number of state employees, while nearly 300.000 employees of the private sector were becoming unemployed; No success, or even serious effort to combat tax-evasion. Out of the 324.000 small businesses, only 255.000 were left operating a year later. No wonder Greece fell into such a deep recession (minus 7,3% in the second quarter of 2011, against Portugal's minus 0,6%); no wonder either that, despite a great reduction of the deficit, the targets set by the Troika were not met. The socialist government, dear friends, seemed to mobilise only when the periodical checks of the Troika were under way. In between they were lingering with inertia. Now, on the eve of the 6th installment, hurriedly and in fear, they resorted to a wild taxation of people's properties to a degree that, in some cases, approaches confiscation; this tax is to be collected via the electricity bills. Tens of thousands of citizens have asked for their electricity to be cut-off, as they are unable to pay these bills. It is understandable that the Troika and our E.U. partners now demand (at last!) structural changes, not taxes; implementation, not promises. Allow me to say that the E.U., just as it, unpardonably, exercised no essential control of the way its funds were condumed for 30 years, neither checked excessive Greek borrowing, has again failed to set the stage correctly when arranging the bailout. The European bailout money, in the way it was applied by the Socialists simply fed the system, and the measures taken with the Troika's consent have completely marginalized the healthy, low-abiding and productive forces of Greece. There is a concise and clear presentation of why the mistakes of the Troika, coupled those of the Socialist government have led to these poor results in the latest "Athens Review of Books". - No clear targets were set for combatting tax-evasion, and no technical assistance for that core issue has arrived two years later. - There was no EU insistence for swift privatisations before the stock exchange nullified the value of state enterprises. To offer you but one example, OTE, the partially state-owned Greek Telecommunications Company, recently sold 10% of its assets for 390 million euros. Just a year ago, these same assets were valued at 790 million euros! A similar course was followed in other cases as well. How on earth are they going to get 50 billion Euros from privatisations in this climate of recession, Stock-Exchange depreciation and swift devaluation of assets? - The Troika, furthermore, did not insist on a balance between tax increases and expenditure cuts, which was of the essence. - European money without structural reforms fed consumption rather than investment. 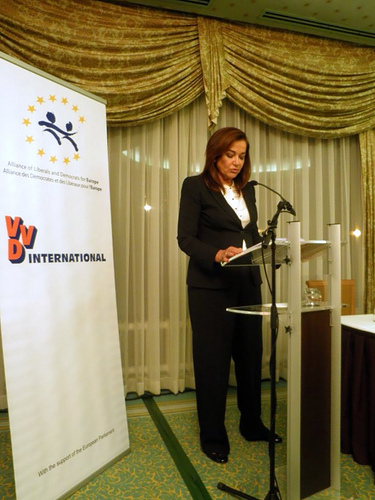 - The Troika also failed to fundamentally see the political and social dimension of the issues. Liquidity was sacked from companies. - There was no ruling on the 290 million Euros allotted to the Greek political parties, or on the scandalous state loans to several media. - There was no attempt to stop the early retirement of civil servants who, terrified, were leaving their jobs early to safeguard their retirement allowances. - Finally, there was no substantial, swift, and effective cost reduction programme, as in Latvia, which suffered for a year and then rebounded spectacularly. In this slow motion followed by Greece, the debt rebounded as it was not drastically and swiftly reduced. Interest rates increased it further. In view of this dramatic situation, many of Greece's liberals, scattered inside the other parties, in December 2010, decided to at last form a Greek Liberal Party of consequence; and the "Democratic Alliance" came into existence. A few months later, in our first party Congress, we decided to become a member at the ALDE Group. I am proud that the ALDE Group in the European Parliament was the first and only to realize the shortcomings of both the bailout and of its application, and to suggest a dramatic shift of course. We are grateful to Guy Verhofstadt and to all our Liberal brothers in the European and National parliaments for this fantastic work we did together, and, above all, for their decisive support. This was a major step in the right direction! Much of it became common ground for the other groups later, but only after the Liberals and Democrats both adopted and promoted it. We liberals knew that the approach vis – a – vis Greece adopted by European leaders was running behind the facts. It was, as I said, too soft, far too limited and modest to convince the markets that the euro crisis is under control, let alone that it has been overcome. In order to be genuinely convincing, a radically different package was required: a comprehensive, coherent strategy, an all-embracing approach, which goes to the root of the matter. This was necessary in order to solve the Greek problem, to stop the contamination of the Eurozone, and to keep the euro as such out of the danger zone. We supported a deep-rooted strategy: this strategy must be based on reforms and austerity, but also (in order to prevent a collapse of the economy), on investments and growth. - A bolder, faster and more realistic fiscal consolidation programme, based mainly on reducing government expenditure; a programme that would decrease the accumulation of public debt and positively surprise the markets. This should be based on a two thirds reduction of public expenditure and only one third in raising new taxes. - A long-term institutional reform programme, able to deal with corruption and clientele-type political practices, with technical assistance from the relevant EU services and agencies. - a reduction of the tax burden on business in order to promote growth. 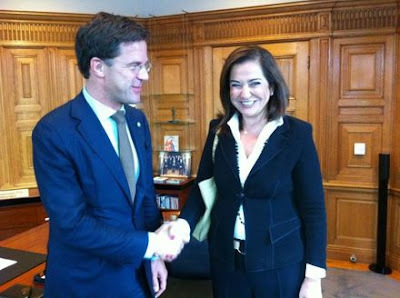 - the reallocation of resources from the European budget and/or from the European Investment Bank. An E.U. investment package must aim at reanimating the Greek national economy, stimulating economic growth and reducing the public debt to GDP ratio. This package should amount to 30 billion Euros, of which 10 billion could easily be taken from the 2014-2020 funding period. Co-financing could be exceptionally dropped, or covered, by revolving funds. - we asked for guarantees from the EU and the European Investment Bank for new private investments in Greece. - we suggested that part of the privatisation programme (for example 25%) should be allocated to a fund for investment. - we insisted that the privatisation programme should be redesigned, so that it would not end up with too rapid sales of Greek public assets, which, as I said, are going to hurt both the country and the lending nations, as they receive less return on their loans. This can be best achieved if the sales – especially of real estate property – are given more time (e.g. 7 instead of 5 years), and the revenues are contractually divided between the Greek state (for the investment fund mentioned above) and the lending nations. - We proposed to lower the interest rates to the level of the IMF, which was lending at 3,5%, rather than the rate imposed by the EU Member States, which was 5%. You already know that many of our proposals are now part of the Medium-Term programme. But efforts are also needed from the bondholders. There are basically two options: to make them accept that, on their Greek bonds, the maturity will be extended, or, and this may be a better option, accept to exchange the current bond package for a smaller package of secure AAA European bonds, or EFSF bonds. All these innovative proposals indicate the way both the Greek government and the Troika should have moved from the start. But, better later than never! Two precious years were essentially lost; and we all know the reaction of the markets. But there should be no excuse now: We all know only too well the effect a Greek bankruptcy would have not only on Greece and the E.U. but on the world financial system also; the Americans estimate the systemic loss of this Mayhem to nearly 2 trillion euros, not to mention the possible collapse of the Eurozone, if Italy follows suit. We all know by now that the Chinese ideogramme for "crisis" can also be read as an "opportunity". This is indeed an opportunity of a Titanic scale for reshaping Europe while, at the same time, ridding Greece of her structural and economic malaise. I know we will all bleed; Most of the bleeding will be that of the Greek people. First, we need to immediately change the course of the Greek programme, directing it to state cuts and reforms, not taxation. Then we need to enhance the country's productive capacity. Depression will doom Greece and shadow Europe. Then we need to create a firewall for our banks, by sharply increasing their capital reserves and to greatly expand the European Financial Stability Facility, the EFSF. But above all, we need the political will to change Europe. We must not allow this crisis to revitalize nationalism and poison our joint achievement. It is sad that the country that gave Europe its name and the great fundamentals of its civilization, now seems to many as a peril and a pariah for Europe. 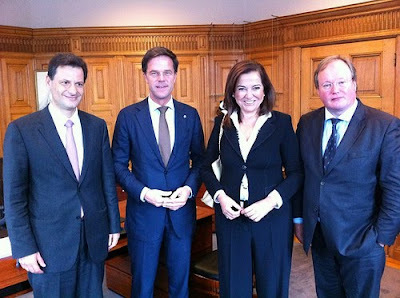 My Dutch friends: understand Greece; support Greece. She has offered scores of blood and ideas for Europe in the course of her 4000 years of history; and this is the first time she has been so victimised by Europe, no doubt through her own faults and shortcomings. Perhaps her indirect contribution to Europe, even now, will be the realisation that we need to move forward with our European project and not return to the antagonisms and suspicions between national states that wrecked Europe in the first half of the 20th century. - The programme of support for the indebted states. - The European Stability Mechanism. - The strengthening of the Stability Pact with six new regulations. In the October European Council, the EU President will unveil new proposals for strengthening the Eurozone's economic governance. Still, in time, the major task would be the safeguarding of our common home, Europe, through the necessary major changes to be agreed by all. The changes in my country, Greece, must be even more dramatic; We in the "Democratic Alliance" are working daily to bring them about. Greece, ladies and gentlemen, is a factor of stability in the world's most critical geostrategic confluence, at the point three continents meet. Her shores, of 16.000 kilometers, comprise one third of the entire Mediterranean sea. Her merchant marine carries 20% of global trade by sea and its tonnage is half that of the entire EU. The Greek people are industrious and well-educated, with one of the highest levels of University graduates and multilingualism in the world. Our ports and harbours link three continents. Our mineral wealth is vast – and mostly unexplored. The capacity to exploit renewable sources of energy, is probably, Europe's largest. A new, business friendly environment, will make the Greeks of Greece as successful as their brothers at sea and in Europe, or America. Last, but not least, Greece possesses the honour and privilege of being what many call "the mother of this continent". And there's nothing more inhumane than letting one's mother fall when all she needs is support at her cruelest hour. We, liberals, are proud to have had concrete ideas both about Greece and about the European crisis and to have been pioneers in promoting them. Ideas that, if applied, will save not only Greece, but the Euro, as well. I am proud to be among exactly such liberal Europeans here tonight. Σας ευχαριστώ για την πρόσκλησή σας, να απευθυνθώ σε ένα τόσο εκλεκτό κοινό φιλελεύθερων πολιτικών, πανεπιστημιακών και στελεχών του αδερφού μας κόμματος και της Φιλελεύθερης Διεθνούς στην Ολλανδία. Οι χώρες μας βρίσκονται σε διαφορετικά σημεία της Ευρώπης, αλλά παρ’ όλα αυτά, είναι στο ίδιο στρατόπεδο σς μια δοκιμαζόμενη Ευρώπη. Είμασταν σύμμαχοι για πολλές δεκαετίες και οι δύο χώρες μας έχουν πολεμήσει δίπλα-δίπλα για την ελευθερία και έχουν υπομείνει βαναυσότητες και κατοχή. Τα πολεμικά μας πλοία έχουν διαπλεύσει τα νερά σε μακρινές θάλασσες αλληλοχαιρετώντας τις σύμμαχες σημαίες μας. Αυτό που έχει ειπωθεί για τους Έλληνες, ότι είναι “ κάτι σαν πολίτες του κόσμου”, μπορεί να ειπωθεί και για τους Ολλανδούς. Σε καιρούς ειρήνης, μετά τον πόλεμο, και οι δύο ενστερνιστήκαμε το όραμα της Ευρωπαϊκής ολοκλήρωσης, που τώρα περνάει μέσα από τη μεγαλύτερη καταιγίδα, μετά την παγκόσμια οικονομική κρίση μόλις πριν τρία χρόνια. Και οι δύο κρίσεις, όπως εύστοχα είπε ο Τζόρτζ Φρίντμαν, είναι “κρίσεις πολιτικής οικονομίας”. Κλασσικοί οικονομολόγοι, όπως ο Άνταμ Σμιθ, ή ο Ντέιβιντ Ρικάρντο, θεωρούσαν αδύνατο να διαχωρίσουν την πολιτική από την οικονομία, ή την οικονομία από την πολιτική. Οι επιλογές, όπως μας θυμίζει σωστά ο Φρίντμαν, πλαισιώνονται από το πολιτικό σύστημα, μέσα στο οποίο προσφέρονται. Η παρούσα οικονομική κρίση, κατά τον Φρίντμαν, ξεκίνησε από την κατάρρευση των ενυπόθηκων δανείων υψηλού κινδύνου στις ΗΠΑ, σε ένα χρηματοπιστωτικό σύστημα που παρήγαγε τίτλους με βάση την τιμή των ακινήτων. Η τιμή των ακινήτων διολίσθησε και ολόκληρο το Αμερικανικό χρηματοπιστωτικό σύστημα βρέθηκε σε αδιέξοδο. Στη συνέχεια, η κρίση μεταφέρθηκε στην Ευρώπη, όπου πολλά χρηματοπιστωτικά ιδρύματα είχαν αγοράσει τέτοιους τίτλους. Εξακολουθούμε να υποφέρουμε λόγω του ότι η πολιτική ελίτ επέτρεψε στην οικονομική ελίτ να διαχειριστεί το σύστημα προς όφελός της. Η διαφύλαξη του συστήματος, εκ μέρους των κρατικών αρχών, μετέτρεψε την κρίση σε κρίση υπερβολικού δημοσίου χρέους. Όταν η κρίση έφτασε στην Ευρώπη, βιαστήκαμε να διαφυλάξουμε τις τράπεζές μας, ενώ η ύφεση βάθαινε και σύντομα δημιούργησε δυσανάλογες κρίσεις σε χώρες της Ευρωπαϊκής περιφέρειας, όπως η Ελλάδα., όταν η ανάπτυξη σταμάτησε, οι διαρθρωτικές αδυναμίες ήρθαν στην επιφάνεια και ο δανεισμός (επιτόκια) επιδεινώθηκε ραγδαία. Είναι σημαντικό να κατανοήσουμε πως, παρά τις περί του αντιθέτου απόψεις, η κρίση στην Ευρώπη δεν εδράζεται αποκλειστικά στην κρίση της Ελλάδας, της οποίας το ΑΕΠ δεν ξεπερνά το 2,5% εκείνου της Ευρωζώνης. Η Ευρώπη όμως βρισκόταν σε πολύ αδύναμη θέση ως προς την αντιμετώπιση μιας κρίσης δημοσίου χρέους. Σε αντίθεση με τις ΗΠΑ, η Ευρώπη δεν έχει τις θεσμικές δυνατότητες να διαχειριστεί γρήγορα την κρίση μέσω ενός κεντρικού συστήματος λήψης αποφάσεων. Οι ΗΠΑ, μετά τον Πόλεμο της Ανεξαρτησίας, βρέθηκαν για μερικά χρόνια, στην ίδια θέση: αδύναμη κεντρική εξουσία, ανεξάρτητες Πολιτείες, οικονομική κρίση σε ορισμένες απ' αυτές και υψηλά χρέη. Αλλά η αίσθηση περί υπάρξςως μιας εξωτερικής απειλής, της Βρετανίας, τους ένωσε και από κει και πέρα το σύστημα έθεσε στόχους, και κατέστη ικανό να διαχειριστεί την χρηματοπιστωτική κρίση και τις υπόλοιπες κρίσεις που ακολούθησαν. Κοινό νόμισμα και νομισματικό σύστημα, αλλά εθνικό έλεγχο της δημοσιονομικής και χρηματοπιστωτικής πολιτικής αλλά και του τραπεζικού συστήματος. Κεφάλαια, αλλά όχι πολλές πανευρωπαϊκές Τράπεζες. Επιτόκια αλλά όχι φορολογική πολιτική. Ένα νόμισμα αλλά σχεδόν κανέναν από τους πολιτικούς μηχανισμούς που είναι απαραίτητοι για την διαχείριση της οικονομίας της Ευρωζώνης. Το αποτέλεσμα ήταν πως, για σχεδόν 10 χρόνια, οι πιο αδύνατες οικονομίες της Ευρωζώνης μπορούσαν να δανείζονται υπέρμετρα με “Γερμανικά” επιτόκια. Το premium των κρατικών ομολόγων στην Ελλάδα για παράδειγμα, έπεσε από to 18% premium έναντι των Γερμανικών ομολόγων σε κάτω από 1% την περίοδο από την ένταξη στο ευρώ και μέχρι την έναρξη της παρούσας κρίσης.. Όταν η παγκόσμια κρίση και η ύφεση σταμάτησαν τους υψηλούς ρυθμούς ανάπτυξης (περίπου 4% ετησίως, ή και παραπάνω στην Ελλάδα κατά την προηγούμενη δεκαετία) οι διαρθρωτικές, πολιτικές, κοινωνικές και οικονομικές αδυναμίες χωρών όπως η Ελλάδα βρέθηκαν στο προσκήνιο, μαζί με τα υπέρογκα ελλείμματα, που αυξάνονταν τώρα ραγδαία, λόγω των υψηλών επιτοκίων. Αφού σας ανέφερα το πλαίσιο μέσα στο οποίο ξέσπασε η κρίση στην Ελλάδα και σε άλλες ευρωπαϊκές χώρες, επιτρέψτε μου να επιστήσω την προσοχή σας στις ιδιαιτερότητες του ελληνικού δράματος. Η ελληνική τραγωδία ονομάζεται τραγωδία όχι μόνο επειδή αφορά την χώρα μου, άλλες χώρες-οφειλέτες και την Ε.Ε στο σύνολό της, αλλά και επειδή έχει θέσει πολύ περισσότερα ερωτήματα από όσα έχει απαντήσει. Το ελληνικό ΑΕΠ πριν την κρίση ήταν μόλις 6 φορές μικρότερο από της Ινδίας, μιας χώρας 150 φορές μεγαλύτερης σε πληθυσμό, (240 δις η Ελλάδα 1,2 τρις η Ινδία). Ήταν διπλάσιο από όλες τις Βαλκανικές χώρες, εξαιρουμένης της Ρουμανίας. Από το 1912 έως το 1922 πολεμήσαμε σε δυο Βαλκανικούς πολέμους, διπλασιάσαμε το μέγεθος της χώρας, πολεμήσαμε στον Πρώτο Παγκόσμιο Πόλεμο και στην καταστροφική εκστρατεία στην Μικρά Ασία. Στο τέλος, ως αποτέλεσμα αυτού του καταστροφικού πολέμου, έπρεπε να ενσωματώσουμε στην χώρα 1,2 εκατομμύρια πρόσφυγες. Και το καταφέραμε χωρίς να χρεοκοπήσουμε ! Πώς λοιπόν, αναρωτιούνται, εν μέσω μιας ειρηνικής περιόδου ανάπτυξης κατρακυλήσαμε στον Άδη και γίναμε δακτυλοδεικτούμενοι? Δεν είναι διόλου παράξενο που βλέπει κανείς τόσες απεργίες και διαδηλώσεις στην Ελλάδα: οι μισθοί μειώνονται, σε κάποιες περιπτώσεις ακόμα και κατά 40%. Η ανεργία μεταξύ Ιουνίου 2010 και Ιουνίου 2011 αυξήθηκε κατά 231.000 άτομα και ο συνολικός αριθμός φτάνει τους 1 εκατομμύριο περίπου ανέργους σε μια χώρα με εργατικό δυναμικό 5 εκατομμυρίωντο πολύ. Οι φόροι συνεχώς αυξάνονται, ραγδαία, και τους καταβάλλουν μόνο οι νομοταγείς πολίτες, ενώ η μαύρη οικονομία εξακολουθεί να ανθεί. Το σοκ και η έκπληξη για την δραματική κατάρρευση έχει συνταράξει τους Έλληνες. Εξαιρώντας την σύντομη διακυβέρνηση του Κωνσταντίνου Μητσοτάκη το 1991-93, κανείς δεν είχε προειδοποιήσει τους Έλληνες για τα υφέρποντα, βαθειά και διαρθρωτικά προβλήματα της χώρας, σε πολιτικό και οικονομικό επίπεδο. Μετά την πτώση της χούντας το 1974, θέριεψε στην Ελλάδα η στροφή προς τα Αριστερά, ως αντίδραση της ελληνικής κοινωνίας στην ακροδεξιά δικτατορία. Το 1981 όμως, ο πατέρας του Πρωθυπουργού, σάρωσε την Ελλάδα με την αριστερίστικη ρητορική του, τον λαϊκισμό και την δραματική αύξηση του δανεισμού. Δημιουργήθηκε ένα κράτος οπαδών, μια νοοτροπία λιγότερης και όχι περισσότερης προσπάθειας, έλλειψης αριστείας, και ένας κομματικός στρατός δημοσίων υπαλλήλων. Δώθηκαν γενναιόδωρα, αλλά όχι βασισμένα στην παραγωγικότητα, επιδόματα και παροχές σε μεγάλα τμήματα του πληθυσμού. Η διαφθορά άνθησε σε πρωτόγνωρο βαθμό, παρόλο που πάντα υπήρχε. Από τότε δεν πατάχθηκε ποτέ. Ως φιλελεύθεροι, γνωρίζουμε καλά πως ο τεράστιος δημόσιος τομέας πάντα επικρατεί εις βάρος του ιδιωτικού και αποτρέπει την παραγωγικότητά του μέσω της υπερρύθμισης, της διαφθοράς, της γραφειοκρατίας και όλων των άλλων κακών του κρατισμού. Ο Έλληνας επιχειρηματίας, με τις θεμιτές του επιδιώξεις, προτιμούσε οικογενειακές και εμπορικές επιχειρήσεις μικρής κλίμακας και όχι τον τομέα της βιομηχανίας. -Ο τεράστιος, σε μεγάλο βαθμό διεφθαρμένος και αναποτελεσματικός δημόσιος τομέας. -Οι μικρές επιχειρήσεις, οι περισσότερες εκ των οποίων προσανατολίζονται στην κατανάλωση και όχι στην παραγωγή αγαθών. -Οι “κλειστές” και υπερρυθμισμένες αγορές καθώς και τα επαγγέλματα. -Οι χαοτικές και χρονοβόρες διαδικασίες για την ίδρυση μιας επιχείρησης ή εργοστασίου, είτε από Έλληνες είτε ως ξένη επένδυση. Δεν είναι επομένως περίεργο που η Ελλάδα, παρά την εξαιρετική θέση και το υψηλού επιπέδου ανθρώπινο δυναμικό της, υπολείπεται των άλλων χωρών της Ε.Ε σε άμεσες ξένες επενδύσεις. -Οι υψηλοί φόροι, χωρίς επαρκείς κοινωνικές παροχές και το περίπλοκο, διεφθαρμένο και ανεπαρκές, φορολογικό σύστημα που αφήνει ανεξέλεγκτη τη μαύρη οικονομία. -Οι προνομιούχες κρατικές επιχειρήσεις με υψηλές απολαβές για τους εργαζόμενους τους, γεγονός που εκτινάσσει το έλλειμμα. -Η έλλειψη εργασιακής κινητικότητας και η μη ύπαρξη ευελιξίας στις επιχειρήσεις για να προσλαμβάνουν ή να απολύουν. -Το υπερφορτωμένο και αργό δικαστικό σύστημα. Η Ελλάδα, ως αποτέλεσμα όλων αυτών των ΔΟΜΙΚΩΝ αδυναμιών, χαρακτηρίζεται από μια χρόνια ανισορροπία μεταξύ εισαγωγών και εξαγωγών, με τις εξαγωγές να αποτιμώνται στο 1/3 της τιμής των εισαγωγών. Αυτό συνέβη λόγω της έλλειψης ξένων επενδύσεων, της αδύναμης βιομηχανικής βάσης της χώρας και των λοιπών αδυναμιών που σας ανέφερα πιο πριν. Το μόνιμο αντιστάθμισμα ήταν το ξένο συνάλλαγμα από τη ναυτιλία και τον τουρισμό, με συμβολή 10 με 15 δις περίπου από τον κάθε τομέα, και βέβαια ο δανεισμός. Όπως είπα ήδη, τα χαμηλά επιτόκια διευκόλυναν το δανεισμό. Η ανευθυνότητα, κατά την άποψή μου, βαρύνει και τους δανειστές και τους δανειζόμενους. Ούτε το ελληνικό κράτος, ούτε η Ε.Ε και τα χρηματοπιστωτικά ιδρύματα προσπάθησαν να κατανοήσουν ότι η ευημερία αυτή και η μεγάλη αύξηση του ΑΕΠ ήταν αποτέλεσμα κατανάλωσης και όχι παραγωγής. Γι' αυτό θεωρώ πώς όλοι όσοι είναι υπεύθυνοι γι' αυτήν την απερισκεψία θα πρέπει, τουλάχιστον μερικώς, να αναλάβουν και το κόστος, είτε είναι Έλληνες, είτε όχι. Εν τω μέσω αυτής της καταστροφής, ο μόνος διοικητικός φορέας που απολάμβανε υψηλής αξιολόγησης από τη Moody's (ΑΑΑ) ήταν ο Δήμος Αθηναίων, τον οποίο υπηρέτησα ως Δήμαρχος κατά την διάρκεια των Ολυμπιακών Αγώνων και του οποίου τα οικονομικά βρίσκονταν σε υγιά και στέρεη βάση. Η Αθήνα σήμερα περνάει την πιο δύσκολη περίοδό της και το αίσθημα του ενθουσιασμού και της αποδοτικότητας έχει χαθεί σχεδόν ολοσχερώς μαζί με τα οικονομικά της μεγέθη, τα οποία επίσης κατρακυλούν τα 6 τελευταία χρόνια. Πιστεύω πως έχετε πλέον μια πιο καθαρή εικόνα των βαθιών διαρθρωτικών αιτιών, λ΄γω των οποίων οποίων η Ελλάδα, όταν σταμάτησε η ανάπτυξη, όταν οι αγορές θορυβήθηκαν και όταν τα επιτόκια πήραν την ανιούσα, βρέθηκε αντιμέτωπη με μια πρωτόγνωρη κρίση. 30 χρόνια συσσωρευμένων αδυναμιών εξερράγησαν σαν ηφαίστειο. Η κυβέρνηση Παπανδρέου, μη θέλοντας να στραφεί ενάντια στις σοσιαλιστικές τις ρίζες, έχασε μήνες αδρανώντας, ενόσω τα spreads των ελληνικών κρατικών ομολόγων εκτοξεύονταν. Οι σοσιαλιστές ασχολούνταν με το να διατηρήσουν εν ζωή τις πολιτικές δαπανών. Αυτό οδήγησε στο πρώτο πακέτο διάσωσης και στην άφιξη της Τρόικας. Ένα αίσθημα ευθύνης, εθνικής και Ευρωπαϊκής, με οδήγησε τότε στην υπερψήφιση του Μνημονίου μεταξύ Ελλάδας, Ε.Ε, Δ.Ν.Τ και Ευρωπαϊκής Κεντρικής Τράπεζας, ώστε να μην καταρρεύσει η χώρα,. Αυτό οδήγησε στην διαγραφή μου από το έως τότε κόμμα μου, τη Νέα Δημοκρατία, που από τότε έχει ακολουθήσει μια πορεία λαϊκίστικη και με ορισμένα ανησυχιτικά ακροδεξιά χαρακτηριστικά. Η σοσιαλιστική κυβέρνηση, μη θέλοντας να αντιμετωπίσει το πρόβλημα του υπέρογκου δημόσιου τομέα, γιατί ήταν στελεχωμένος κυρίως με δικούς της οπαδούς, έδειξε και απροθυμία και ανικανότητα να αντιμετωπίσει το βασικό αίτιο του τεράστιου ελλείμματος της Ελλάδος: τη μείωση του υπέρογκου δημοσίου τομέα. Αντίθετα: στράφηκε εναντίον των νομοταγών και ειλικρινών φορολογουμένων με απανωτές οριζόντιες περικοπές του εισοδήματός τους και με αύξηση των φόρων. Δεν έκλεισε κρατικές επιχειρήσεις, δεν προχώρησε σε ιδιωτικοποιήσεις, δεν μείωσε τον αριθμό των δημοσίων υπαλλήλων, ενώ 300.000 υπάλληλοι του ιδιωτικού τομέα έμειναν άνεργοι. Καμία επιτυχία, ούτε καν μια σοβαρή προσπάθεια, για να αντιμετωπιστεί η φοροδιαφυγή. Από τις Δεν είναι παράξενο, λοιπόν, που η Ελλάδα έπεσε σε τόσο βαθειά ύφεση (-7,3% το δεύτερο τρίμηνο του 2011, με την Πορτογαλία να βρίσκεται στο -0,6%). Δεν είναι, επίσης, καθόλου περίεργο ότι , παρά τη μεγάλη μείωση του ελλείμματος, οι στόχοι που έθεσε το Πρόγραμμα δεν επετεύχθησαν. Η σοσιαλιστική κυβέρνηση, αγαπητοί φίλοι, έδειξε να κινητοποιείται μόνο όταν αναμένονταν οι έλεγχοι της Τρόικας. Στο μεσοδιάστημα έπεφτε σε αδράνεια. Τώρα, παραμονές της 6ης δόσης, βιαστικοί και τρομοκρατημένοι, κατέφυγαν σε άγρια φορολόγηση των περιουσιών των πολιτών, σε τέτοιο βαθμό, που σε κάποιες περιπτώσεις προσεγγίζει την κατάσχεση. Ο φόρος αυτός θα εισπραχθεί μέσω των λογαριασμών του ηλεκτρικού. Δεκάδες χιλιάδες πολιτών ζήτησαν να διακοπεί η σύνδεση του ηλεκτρικού τους, επειδή δεν μπορούν να πληρώσουν αυτούς τους λογαριασμούς. Είναι κατανοητό πια το γιατί η Τρόικα και οι Ευρωπαίοι εταίροι μας τώρα (επιτέλους!) απαιτούν διαρθρωτικές αλλαγές, όχι άλλους φόρους. Ζητούν αποτελέσματα, όχι άλλες υποσχέσεις. Επιτρέψτε μου να πω πώς η Ε.Ε, όπως δεν άσκησε ουσιαστικό έλεγχο στον τρόπο με τον οποίο χρησιμοποιήθηκαν τα κονδύλιά της για 30 χρόνια, ούτε έλεγξε τον υπέρογκο ελληνικό δανεισμό, έτσι και τώρα απέτυχε να θέσει τις σωστές βάσεις για το πακέτο διάσωσης. Τα ευρωπαϊκά κονδύλια για το πακέτο διάσωσης, έτσι όπως χρησιμοποιήθηκαν από τους σοσιαλιστές, απλώς τροφοδότησαν το σύστημα. Τα μέτρα που ελήφθησαν με την συγκατάθεση της Τρόικας, περιθωριοποίησαν τις υγιείς, νομοταγείς και δημιουργικές δυνάμεις της Ελλάδος. Υπάρχει μια συνεκτική και σαφής εξήγηση των λόγων για τους οποίους τα λάθη της Τρόικας, σε συνδυασμό με αυτά της σοσιαλιστικής κυβέρνησης, οδήγησαν σε ανεπαρκή αποτελέσματα, στην τελευταία έκδοση του “Athens Review of Books”. -Δεν τέθηκαν σαφείς στόχοι για την αντιμετώπιση της φοροδιαφυγής ούτε προσφέρθηκε ουσιαστική τεχνική βοήθεια στον τομέα αυτό μέχρι πρόσφατα. Η Ε.Ε δεν επέμεινε στις άμεσες ιδιωτικοποιήσεις πριν το Χρηματιστήριο υποτιμήσει την αξία των κρατικών επιχειρήσεων. -Επιπλέον, η Τρόικα δεν επέμεινε στην ισορροπία μεταξύ αύξησης των φόρων και περικοπής των δαπανών, που ήταν και η ουσία του εγχειρήματος. -Τα ευρωπαϊκά κονδύλια, χωρίς διαρθρωτικές αλλαγές, τροφοδοτούσαν μόνο την κατανάλωση και όχι τις επενδύσεις. -Η Τρόικα επίσης, απέτυχε να κατανοήσει την πολιτική και κοινωνική διάσταση αυτών των μέτρων. Η ρευστότητα στέρεψε από τις επιχειρήσεις. -Δεν υπήρξε καμιά απόφαση για τα εκατομμύρια ευρώ, με τα οποία επιχορηγούνται ετησίως τα κόμματα, ούτε και για τα σκανδαλώδη κρατικά δάνεια σε κάποια ΜΜΕ. -Δεν έγινε καμιά προσπάθεια να σταματήσει η πρόωρη συνταξιοδότηση δημοσίων υπαλλήλων που, τρομοκρατημένοι, έφευγαν από τη δουλειά τους για να διασφαλίσουν τα συνταξιοδοτικά τους προνόμια. -Τέλος, δεν υπήρξε ένα πρόγραμμα ουσιαστικό, άμεσο και αποτελεσματικό ως προς τη μείωση του κόστους, όπως συνέβη στη Λετονία, που υπέφερε για έναν χρόνο και μετά ανέκαμψε εντυπωσιακά. Σε αυτόν τον αργό ρυθμό με τον οποίο κινήθηκε η Ελλάδα, το χρέος επιμένει να αυξάνεται σημαντικά, εφόσον δεν μειώθηκε άμεσα και δραστικά. Τα επιτόκια το αύξησαν ακόμη περισσότερο. Έχοντας υπ' όψιν αυτήν τη δραματική κατάσταση, πολλοί από τους Έλληνες φιλελεύθερους, διασπαρμένοι στα ως τότε κόμματά τους, το Δεκέμβρη του 2010, αποφάσισαν να ιδρύσουν επιτέλους ένα ελληνικό γνήσιο φιλελεύθερο κόμμα ευθύνης. Και έτσι ιδρύθηκε η Δημοκρατική Συμμαχία. Λίγους μήνες αργότερα, στο πρώτο συνέδριο του κόμματος, αποφασίσαμε να ενταχθούμε στην ομάδα των Φιλελευθέρων Δημοκρατών του Ευρωπαϊκού Κοινοβουλίου (ALDE). Είμαι υπερήφανη που η ομάδα του ALDE στο Ευρωπαϊκό Κοινοβούλιο ήταν η πρώτη και η μόνη που συνειδητοποίησε τις ελλείψεις τόσο του προγράμματος διάσωσης όσο και της εφαρμογής του και πρότεινε μια ριζική αλλαγή πορείας. Είμαστε ευγνώμονες στον Γκυ Φερχόφσταντ και στους φιλελεύθερους συναδέλφους μας στο ευρωπαϊκό αλλά και στα εθνικά κοινοβούλια για την εξαιρετική δουλειά που κάναμε από κοινού και πάνω απ' όλα για την αποφασιστική τους υποστήριξη. Αυτό ήταν ένα άλμα προς την σωστή κατεύθυνση ! Ένα μεγάλο τμήμα του προγράμματός μας αποτέλεσε κοινό τόπο για τις άλλες ομάδες, αφού όμως είχε ήδη εγκριθεί και προωθηθεί από τους Φιλελεύθερους Δημοκράτες. Εμείς οι φιλελεύθεροι, γνωρίζαμε ότι η απόφαση για την Ελλάδα που έλαβαν οι Ευρωπαίοι ηγέτες, είχε ξεπεραστεί από τις εξελίξεις. Ήταν πολύ περιορισμένη και μετριοπαθών φιλοδοξιών για να πείσει τις αγορές ότι η κρίση του ευρώ βρίσκεται υπό έλεγχο, πολύ περισσότερο δε ότι ξεπεράστηκε. Για να είμαστε πραγματικά πειστικοί, χρειαζόταν ενα τελείως διαφορετικό πακέτο: μια συνολική, συνεκτική στρατηγική, μια καθολική προσέγγιση που να φτάνει στην ρίζα του προβλήματος. Αυτό ήταν απαραίτητο για να λυθεί το ελληνικό πρόβλημα, να αποφευχθεί η μετακύλισή του στην Ευρώπη και να διατηρηθεί το ίδιο το ευρώ εκτός της ζώνης κινδύνου. Στηρίξαμε μια στρατηγική που βασίζεται σε μεταρρυθμίσεις και στον περιορισμό των δημοσίων δαπανών, καθώς επίσης (για να αποφευχθεί η κατάρρευση της οικονομίας) και στις επενδύσεις και την ανάπτυξη. -Ένα πρόγραμμα δημοσιονομικής ενοποίησης, πιο θαρραλέο, πιο γρήγορο και πιο ρεαλιστικό, βασισμένο κυρίως στον περιορισμό των κρατικών δαπανών. Ένα πρόγραμμα που θα μείωνε την συσσώρευση δημοσίου χρέους και θα εξέπληττε θετικά τις αγορές. Θα βασίζεται σε μείωση κατά δύο τρίτα των δημοσίων δαπανών και μόνο κατά ένα τρίτο στην αύξηση φόρων. - Ένα μακροπρόθεσμο πρόγραμμα θεσμικών μεταρρυθμίσεων, ικανό να αντιμετωπίσει την διαφθορά και τις πελατειακές πολιτικές πρακτικές με τεχνική βοήθεια από τις σχετικές υπηρεσίες και οργανισμούς της Ε.Ε. - μείωση των φορολογικών βαρών στις επιχειρήσεις για να προωθηθεί η ανάπτυξη. - ανακατανομή των πόρων από τον ευρωπαϊκό προϋπολογισμό και/ή από την Ευρωπαϊκή Τράπεζα Επενδύσεων. Ένα ευρωπαϊκό επενδυτικό πακέτο που θα στοχεύει στην ανάταξη της ελληνικής οικονομίας, ενισχύοντας την οικονομική ανάπτυξη και μειώνοντας το ποσοστό του δημοσίου χρέους ως ποσοστού του ΑΕΠ. Το πακέτο αυτό θα ανέρχεται στα 30 δις. ευρώ, εκ των οποίων τα 10 δις μπορούν εύκολα να προέλθουν από την χρηματοδοτική περίοδο 2014-2020. Η συγχρηματοδότηση μπορεί να μειωθεί, ή να καλυφθεί από ανανεώσιμα κεφάλαια. - Ζητήσαμε εγγυήσεις από την Ε.Ε και την Ευρωπαϊκή Τράπεζα Επενδύσεων για νέες ιδιωτικές επενδύσεις στην Ελλάδα. - Προτείναμε ένα τμήμα του προγράμματος ιδιωτικοποιήσεων (πχ. 25%) να πιστωθεί σε ένα Ταμείο Επενδύσεων. Επιμείναμε ότι το πρόγραμμα ιδιωτικοποιήσεων θα πρέπει να σχεδιαστεί από την αρχή, ώστε να μην καταλήγει σε βεβιασμένες πωλήσεις ελληνικής δημόσιας περιουσίας, οι οποίες όπως είπα θα πλήξουν και την χώρα και τις χώρες-δανειστές, μια που θα έχουν μικρότερη απόδοση έναντι των δανείων τους. Αυτό μπορεί να επιτευχθεί, εάν δοθεί περισσότερος χρόνος για την πώληση– κυρίως της ακίνητης περιουσίας – (πχ. 7 αντί για 5 χρόνια) και εάν τα έσοδα κατανεμηθούν συμβατικά μεταξύ του ελληνικού κράτους (για τις επενδύσεις που σας ανέφερα πιο πάνω) και των χωρών-δανειστών. Προτείναμε να μειωθούν τα επιτόκια δανεισμού της Ελλάδος, κάτι που έγινε δεκτό με την απόφαση της 21ης Ιουλίου. Ήδη γνωρίζετε ότι πολλές από τις προτάσεις μας αποτελούν πλέον μέρος των ευρωπαϊκών αποφάσεων, ενώ επανήλθαμε στις αρχές Σεπτεμβρίου και με νέες προτάσεις που κι αυτές έγιναν πολιτική του ALDE και που ενισχύουν ακάμα περισσότερο τοσο την αναπτυξιακή όσο και την δημοσιονομική διάσταση του ελληνικού προγράμματος. Χρειάζονται όμως προσπάθειες και από τους ομολογιούχους. Υπάρχουν δυο βασικές επιλογές: να τους κάνουμε να αποδεχτούν ότι στα ελληνικά ομόλογα που κατέχουν, η ωριμότητα θα παραταθεί ή, αν αυτό είναι καλύτερη επιλογή, να τους πείσουμε να δεχτούν να ανταλλάξουν το πακέτο των ομολόγων τους για ένα πιο μικρό πακέτο ασφαλέστερων ΑΑΑ Ευρωομολόγων, ή ομολόγων EFSF. Όλες αυτές οι καινοτόμες προτάσεις δείχνουν τον τρόπο με τον οποίο η ελληνική κυβέρνηση και η Τρόικα θα έπρεπε να κινηθούν από την αρχή. Κάλλιο αργά παρά ποτέ όμως! Χάθηκαν δυο πολύτιμα χρόνια. Και γνωρίζουμε όλοι τις αντιδράσεις των αγορών. Τώρα όμως δεν υπάρχουν δικαιολογίες: Όλοι γνωρίζουμε πολύ καλά τις επιπτώσεις που θα έχει μια ελληνική χρεωκοπία και στην Ελλάδα και στην Ε.Ε. Αλλά και στο παγκόσμιο χρηματοπιστωτικό σύστημα. Οι Αμερικανοί υπολογίζουν ότι οι συστημικές απώλειες από αυτό το χάος θα ανέρχονταν σε 2 τρις Ευρώ. Για να μην αναφέρω την πιθανή κατάρρευση της Ευρωζώνης, αν μετά την Ελλάδα ακολουθήσει η Ιταλία. Όλοι γνωρίζουμε πώς το Κινέζικο ιδεόγραμμα για τη λέξη “κρίση” είναι το ίδιο και για τη λέξη “ευκαιρία”. Αυτή είναι όντως μια ευκαιρία τεραστίων διαστάσεων για την θεσμική αναδιάρθρωση της Ευρώπης και την οικονομική της διακυβέρνηση, ενώ ταυτόχρονα απελευθερώνουμε την Ελλάδα από τα διαρθρωτικά και οικονομικά της προβλήματα. Γνωρίζω πως θα ματώσουμε όλοι. Περισσότερο θα ματώσουμε εμείς οι Έλληνες. Κατ' αρχάς πρέπει επειγόντως να αλλάξουμε την πορεία του ελληνικού προγράμματος, κατευθύνοντάς το προς κρατικές περικοπές και μεταρρυθμίσεις, όχι προς την φορολόγηση. Έπειτα, πρέπει να ενισχύσουμε τις παραγωγικές δυνατότητες της χώρας. Η ύφεση θα καταστρέψει την Ελλάδα και θα σκιάσει την Ευρώπη. Πρέπει επίσης να δημιουργήσουμε ένα ανάχωμα για τις τράπεζές μας αυξάνοντας δραστικά τα κεφαλαιακά τους αποθέματα και επεκτείνοντας το Ευρωπαϊκό Ταμείο Χρηματοπιστωτικής Σταθερότητας, το EFSF. Πάνω απ' όλα όμως χρειάζεται πολιτική βούληση για να αλλάξουμε την Ευρώπη. Δεν πρέπει να επιτρέψουμε στην κρίση να αναζωογονήσει τον εθνικισμό και να δηλητηριάσει τα μεγάλα μας επιτεύγματα. Είναι λυπηρό, η χώρα που έδωσε στην Ευρώπη το όνομά της και τα μεγάλα ιδεώδη του πολιτισμού της, τώρα να μοιάζει σε πολλούς σαν παρίας και κίνδυνος για την Ευρώπη. Καταλάβετε την Ελλάδα. Στηρίξτε την Ελλάδα. Έχει συχνά δώσει το αίμα και τις ιδέες της για την Ευρώπη στα 4000 χρόνια της ιστορίας της. Και αυτή είναι η πρώτη φορά που θυματοποιείται σε τέτοιο βαθμό από την Ευρώπη η ίδια, και με δική της ευθύνη, δεν λέω, λόγω ελλείψεων και λαθών. Ίσως η έμμεση προσφορά της στην Ευρώπη, ακόμη και σήμερα, να είναι η συνειδητοποίηση ότι χρειάζεται να συνεχίσουμε το ευρωπαϊκό μας σχέδιο, και να μην γυρίσουμε πίσω σε ανταγωνισμούς και καχυποψίες μεταξύ των κρατών που κατέστρεψαν την Ευρώπη στο πρώτο μισό του 20ου αιώνα. -Το πρόγραμμα στήριξης των υπερχρεωμένων χωρών. -Το Ευρωπαϊκό Ταμείο Χρηματοπιστωτικής Σταθερότητας (EFSF). -Η ενίσχυση του πακέτου Σταθερότητας μέσω των 6 νέων κανονισμών. Στο Ευρωπαϊκό Συμβούλιο του Οκτωβρίου, ο Πρόεδρος της Ευρωπαϊκής Ένωσης θα παρουσιάσει τις νέες προτάσεις για την ενίσχυση της ευρωπαϊκής οικονομικής διακυβέρνησης. Σίγουρα ο βασικός στόχος θα είναι η διασφάλιση της γειτονιάς μας, της Ευρώπης, μέσω των απαραίτητων μεγάλων αλλαγών που συμφωνήθηκαν από όλους. Η Ελλάδα, κυρίες και κύριοι, είναι παράγοντας σταθερότητας σε ένα σημείο παγκόσμιας γεωστρατηγικής σημασίας, στο σημείο που ενώνονται τρείς ήπειροι. Οι ακτές της, 16.000 χλμ σε έκταση, αποτελούν το 1/3 ολόκληρης της Μεσογείου. Το εμπορικό ναυτικό της μεταφέρει το 20% του παγκόσμιου εμπορίου μέσω θαλάσσης και ο όγκος του στόλου της σε τόνους είναι το 50% ου συνόλου της Ευρωπαϊκής Ένωσης. Οι Έλληνες είναι εργατικοί και μορφωμένοι, κατέχοντας ένα από τα υψηλότερα ποσοστά αποφοίτων Πανεπιστημίου και πολυγλωσσίας στον κόσμο. Τα λιμάνια και τα αεροδρόμιά μας ενώνουν τρεις ηπείρους. Ο ορυκτός μας πλούτος είναι τεράστιος – και βασικά ανεκμετάλλευτος. Οι δυνατότητες εκμετάλλευσης των ανανεώσιμων πηγών ενέργειας είναι, ίσως, οι μεγαλύτερες στην Ευρώπη. Ένα νέο περιβάλλον, φιλικό προς τις επιχειρήσεις, θα κάνει τους Έλληνες της Ελλάδας εξίσου επιτυχημένους με τους υπόλοιπους διαπρεπείς Έλληνες, της Ευρώπης και της Αμερικής. Εμείς, οι Φιλελεύθεροι, είμαστε περήφανοι που έχουμε συγκεκριμένες και πρακτικές ιδέες για την ελληνική κρίση και είμασταν πρωτοπόροι στην προώθησή τους. Ιδέες που, εάν εφαρμοστούν, θα σώσουν όχι μόνο την Ελλάδα αλλά και το Ευρώ. Είμαι περήφανη που σήμερα βρίσκομαι ανάμεσα, σε αυτούς ακριβώς τους Φιλελεύθερους Ευρωπαίους. Σας ευχαριστώ κυρίες και κύριοι». Χρήστος Α. Κατσαρός ( Chris Sintiki ) 8 Οκτωβρίου 2011 - 12:22 π.μ. Η πρόεδρος του κινήματος, Ντόρα Μπακογιάννη, κατά τη διάρκεια της διήμερης επίσκεψής της στην Ολλανδία συναντήθηκε (5/10) με τον Ολλανδό πρωθυπουργό κ. Μαρκ Ρούττε, από τον οποίο ζήτησε τη στήριξη της Ελλάδας για να βγει επιτέλους η Ευρώπη μπροστά από τις αγορές. Αξίζει να διαβάσετε την ομιλία της (5/10) στην εκδήλωση που διοργάνωσε η Φιλελεύθερη Διεθνής και το κυβερνών φιλελεύθερο "Λαϊκό Κόμμα για την Ελευθερία και τη Δημοκρατία" (VVD) στη Χάγη, με θέμα την κρίση στην Ελλάδα και τις αναγκαίες διαρθρωτικές μεταρρυθμίσεις.